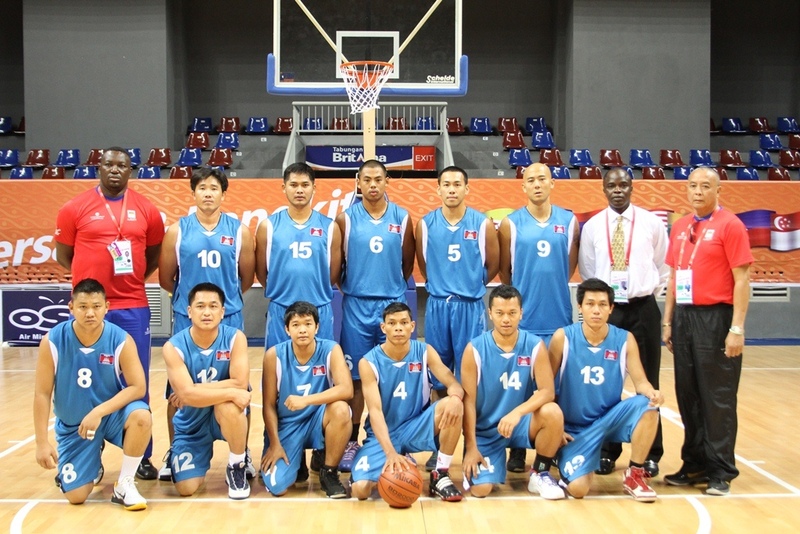 Cambodia Basketball team finished 7th after narrowly beating Myanmar 84-80. Cambodia's medal haul experienced a drought on Friday as none of the competing sports could add to the medal Tally of the kingdom. The sign started on Thursday when Cambodia’s medal charge brought only one silver from judo through Khoam Ratanamony who lost in the finals to Indonesia's Toni Irawan. In a sharp contrast, Petanque, wrestling and boxing combined to bring in three bronze finishes for the Kingdom as the 26th SEA Games entered its second week in Indonesia. On Friday, The high point of the day for Cambodia came at the Britama Arena Kelapa Gading in Jakarta where the basketball Team won the 7th place playoff against Myanmar in a nail biting finish 84 - 80. Cambodia has lost all three group A matches, going down 127-68, 85-62 and 78-57 to Philippines, Thailand and Vietnam respectively. Myanmar finished bottom in group B after losing to Indonesia, Singapore and Malaysia. Both teams came out fully with intent to win making point by point from quarter to quarter until the 3rd quarter when Cambodia took a 10 point lead 70-60. Myanmar wouldnt let go as the closed the gap and even scores in the 4th Quarter 80-80 with 2 minutes to go. Cambodia took a 4 point lead right at the buzzer after converting two straight free throws to win the tie. That was all the good news on Friday for Team Cambodian as the other athletes in contention for medals all fell by the way side. In Judo four Cambodian fighters figure in quarterfinal bouts. Sngoun David (66-73 kg), Kim Saron (60-66 kg) and Chim Keo (55-60 kg) figure in the men’s section and lost out while last year’s Singapore Youth Olympics bronze medallist Sam Sothea who fought for a place for a place in the women’s 45-48kg class was outclassed by her opponent. For Shorinji Kempo, it was a mixed results as four athletes took to the mats at the Ciracas sports Hall in Jakarta. Phat Saren lost to Vietnam's Nguyen Ba Tan int he Me 50k Randori Free Paring just as Un Sovanara also lost to Vietnam's Nguyen Chau Quoc in the 70k Randori Free Paring. On the other hand, Sovan Ratanak and Sovan Rachana both won their fights to progress to the next round. Kempo has given Cambodia 7 bronze medals yet to be updated until the finals which will be concluded this weekend. Hope to add to Cambodia's Gold Medal haul is becoming slimmer by the day as Cambodia is now left with only 5 sports to compete before the curtain is drawn to the 26th SEA Games on 22. Traditional Boat Race, Kempo sports, Judo and Wushu will all be concluded over the weekend in Jakarta, while Gymnastics is the only sport remaining to be concluded in Palembang for the Kingdom. After bagging archery and rowing golds on Thursday, Myanmar managed to sneak ahead of Cambodia in the medals table. Indonesia expectedly continue to maintain an Unassailable lead with a total of 124 gold medals about 50 more than closest rival Vietnam who are above Thailand. East Timor remained at the bottom of the table, with just one bronze from taekwondo to their credit.